When you see the castle for the first time in person, you will understand the description “fairy tale”. It truly looks like a castle out of some of the fairy tale children’s books. Pictures online do not do it justice. 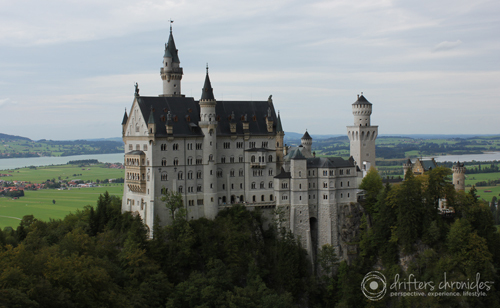 As part of our stay in Munich, we decided to book a tour to Neuschwanstein castle with Mike’s Bike tours. We researched Mike’s Bike tours on Trip Advisory and it had some great reviews. I’m very glad we booked (note – make sure to book in advance). 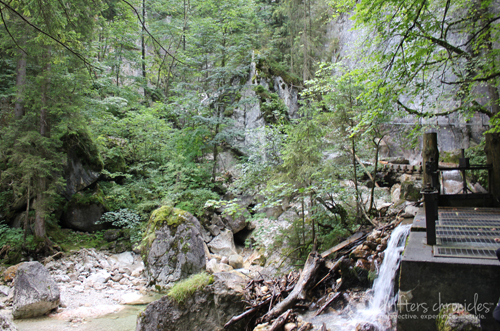 When we arrived in the town of Hohenschwangau, the group cycled around the town. We rode around the town and stopped at a lake. Although it wasn’t the best weather for our tour, you can take a swim in the lake if you wish. After our leisurely bike ride we stopped for a delicious lunch. I had the goulash, a home cooked German meal. It was amazing! We enjoyed a glass of wine and chatted with an American couple at our table. Next door to this quaint restaurant was an alpine slide. 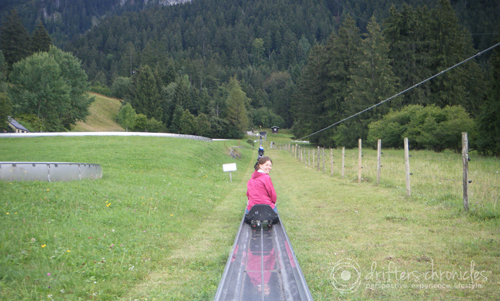 Neither of us had been on an alpine slide before. I jumped on the sled in front and since I don’t like to go fast I had the break on the whole way down. Needless to say there was a pile up behind me, and the person right behind me, Andrew was yelling at me to go faster. The nerve of some people! The picture below is the way up, to the left is the way down. I enjoyed myself and that is the important part. Most of our group went on the alpine slide. 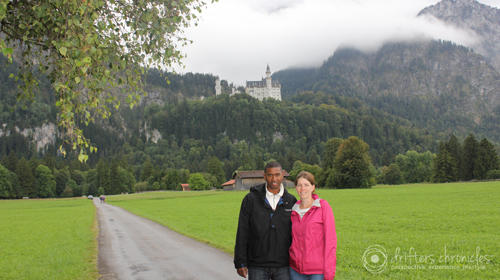 After we made our way over to Neuschwanstein castle. We hiked up the back of the hill that the castle is built. It was great exercise and a lot of fun! It reminded me a little of hiking in Ontario. There were lots of trees, it was green, the air was fresh and invigorating. 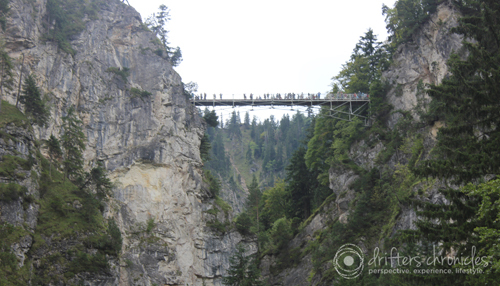 On the hike up you could see Marienbrucke (Queen Mary’s Bridge). From the bridge you can really appreciate the magnificence of the castle. Make sure you tour the castle, there are only about 15 finished rooms. König Ludwig II (King Ludwig II) passed away before the castle was completed. Immediately after his death, the castle opened to the public in 1886. If the castle looks familiar to you its because it was the inspiration for Disney’s Sleeping Beauty castle. 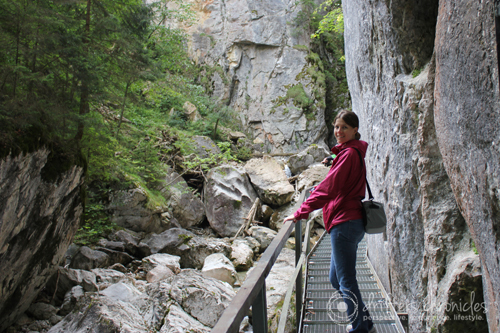 This entry was posted in Architecture, Europe, Experience, Germany, Hers, Lifestyle, Perspective and tagged day trip, Germany, Munchen, Munich, Neuschwanstein, Schloss Neuschwanstein. Bookmark the permalink. Jealous of you going here – looks amazing!